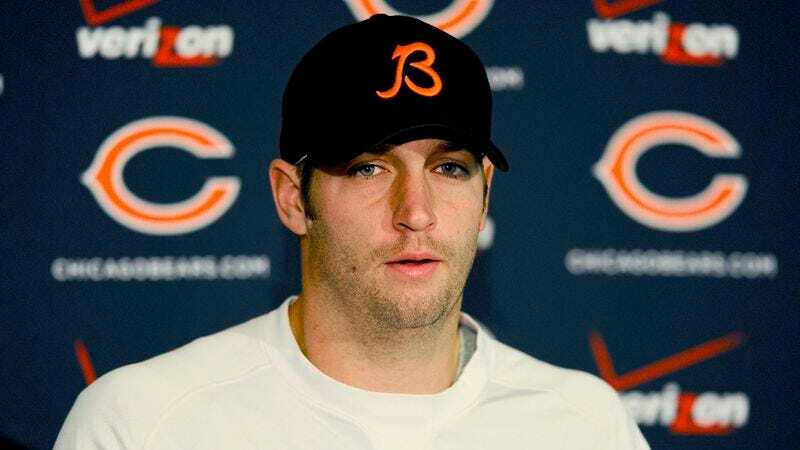 CHICAGO—Following the team’s blowout 55-14 loss to the Green Bay Packers Sunday night, Chicago Bears quarterback Jay Cutler told reporters Tuesday that he would be the first person to admit the team is in dire need of a new punter. “It’s certainly not an easy thing to say, but at the end of the day, someone has to step up and accept that mistakes were made by our punter, Pat O’Donnell,” said Cutler, who pointed to O’Donnell’s blocked punt in the third quarter as playing a major role in the team’s unraveling and conceded that blame for the team’s loss rested squarely on the rookie punter. “Going forward, there will have to be some serious adjustments made to our punt unit—when individual players aren’t doing their part out there, we’re going to fall short as a team. Pat didn’t play well, and he needs to accept responsibility for that.” Cutler went on to acknowledge that Bears long snapper Jeremy Cain will also need to step up his performance significantly before next week’s game against the Vikings if the team is to have any chance of turning its season around.